Did you ever hear of Henry, Herman and Hillel Hassenfeld? The three Polish-Jewish immigrant brothers were legendary in the world of toys back in 1952 when they sold the first of millions of Mr. Potato Head, and later, his mate, Mrs. Potato Head. The Hassenfeld Brothers formed a company that they called Hasbro, now the world's third largest toy company. Hassenfeld Brothers sold the first Mr. Potato Head as a kit of facial parts. It came with a Styrofoam head and instructions that suggested using real vegetables and fruits instead. After parents complained about rotting vegetables and new government safety regulations restricted toys with sharp pieces, Hasbro began selling the plastic potato body in 1964. Mr. Potato Head was the first toy to be advertised on television, and it sold more than a million units in its first year. The next year Mrs. Potato Head was introduced, followed by Brother Spud and Sister Yam, along with cars, trailers and other accessories. Mr. Potato Head has become an American cultural staple. And it all started with vegetables in a Brooklyn kitchen. 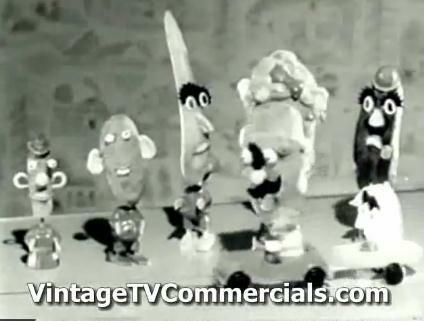 Here is one of the first black and white TV commercials for Mr. Potato Head.